Every single multi-tool I own or have used in the past are of the type that must first be folded open before the pliers can be used. Both opening and closing the pliers is therefore a two-hand operation no matter how quick. 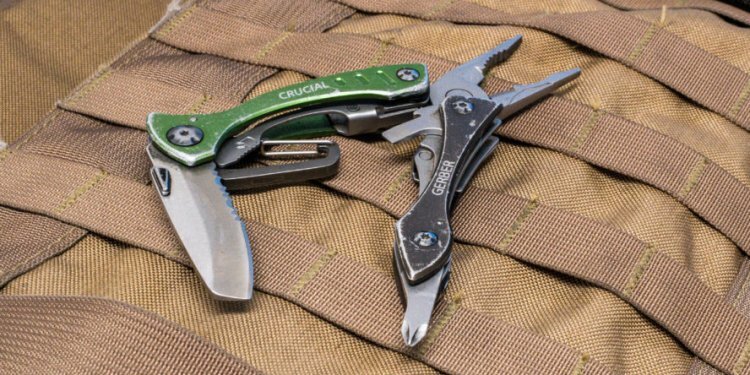 I spent the past few months testing out a Gerber Flik multi-plier tool as part of my EDC rotation. It didn’t win me over, at least not completely, but I have to say – it proved itself a hardy and capable tool. The tool is solid-feeling when closed, and it’s pretty obvious which end the pliers slide out of. Nothing needed adjustment out of the box – a plus for any mass production knife or multi-tool. The Flik isn’t too dust-prone, but you’ll probably want to keep it in a sheath seeing as how there’s no belt clip. I misplaced (tossed aside) the nylon sheath it came with and couldn’t find it for photos. It takes a few minutes to become familiarized with the Flik’s one-handed pliers deployment. You grab the tool, flick it downwards, and the pliers slide right out with their own inertia. Next, spread the handles all the way to prep the pliers for use. Close the handles again and the pliers are ready to use. To return the pliers inside the tool, squeeze the two buttons on the handles and then slide them back. A certain finesse is required, and you will fail to retract the pliers the first few times, but once you figure out the proper sequence of motion you won’t forget it. Since the Flik features a one-hand sliding pliers mechanism rather than a fold-open design, all tools are outside-accessible. The four primary tools – both knife blades, the saw, and scissors – have little engravings that help you locate and open the tool you need on the first try. The plain edge blade has a cutting length of about 2-1/4″. It’s straight with a pointed tip that’s great for precision piercing and scoring. It’s an average blade – nothing special but without major faults. One-handed opening is possible, but it’s easier, quicker, and far more comfortable to just use two hands. The serrated blade is also average with no major faults. Serrations are ground into one side of the blade, which should facilitate sharpening. I didn’t use the serrated blade enough to where it really needed sharpening or honing. It is unclear why the saw blade is pointed, but it should come in handy for piercing through foam and drywall. Multi-tool scissors are either really, really good, or really, really bad. There’s nothing special with how these scissors are designed, but they perform exceptionally well. They are quick and easy to deploy and don’t scratch me up when I try to use them. seo services here SEO Company To-the-TOP!